This 1951 ad takes a moderated view of the collision between established values and incoming ideals in post-war America. The innovative, highly-molded sink—the focal point of the room—physically stands out from the flat planes of the walls, windows, countertop and tailored steel cabinets. The adventurous color scheme provocatively pits an unorthodox palette of dark and light hues against each other. The sink features 'Dial-ese' controls, where a mere quarter-turn of the handle started or stopped the flow of water. As illustrated, the new, modern style posed no threat to the domestic bliss symbolized by the cookie jar and the garden; in fact, it virtually promised the two worlds could seamlessly co-exist. 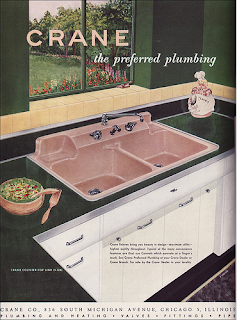 Renowned industrial designer Henry Dreyfuss created much of the Crane bath and kitchen products. In production from the 1920s to the 1980s, the company pioneered the use of color in fixtures. It's really refreshing to see white used as an accent. The snow is melting, at last.